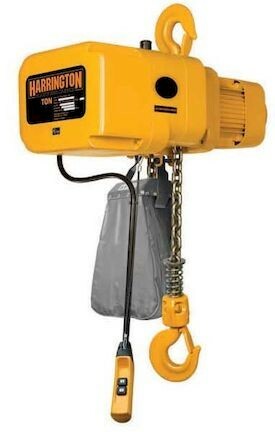 Harrington's (N)ER enhanced features three phase electric chain hoists are equipped with the latest technology in the market today. All models include a low headroom, lightweight body with a fan-cooled motor, standard thermal motor protection and a count hour meter for preventive maintenance. External pins allow for quick change from hook to lug for trolley mount configurations on most models. Built smarter without the use of harmful materials. Environmentally friendly. RoHS compliant. Provides positive closing and improves resistance against lateral forces. low-profile upper and lower limit switches are standard. Decreased chain wear as a result of a revolutionary heat treatment process, improved material and chain size. Cooler motor and brake attributed to an engineered motor fin, fan blade and fan cover design. Increased number of pockets reduce chain vibration and increase chain life. 5 pockets standard; 6 pockets on smaller body hoists. Friction Clutch and Load Brake Friction clutch is standard on NER/ER models and friction clutch with mechanical load brake standard on ER models. Carbon friction material provides consistent performance over a wide temperature range. Standard Count Hour Meter Records and displays the number of lowering starts and hoist on time which is valuable for preventive maintenance. Integral to VFD on dual speed models. Mechanically interlocked, heavy-duty contactors on single speed models. DIN standards, uses unique technology to greatly increase resistance to fatigue and wear. Under-the-cover VFD standard for dual speed hoists. speed ratio is 6:1 with adjustability up to 12:1. A current driven electromagnetic brake does not release unless the motor is energized. 10 year hoist brake warranty. Ergonomic design for operator comfort. Red button emergency stop is standard on all 2-button dual speed pendants.